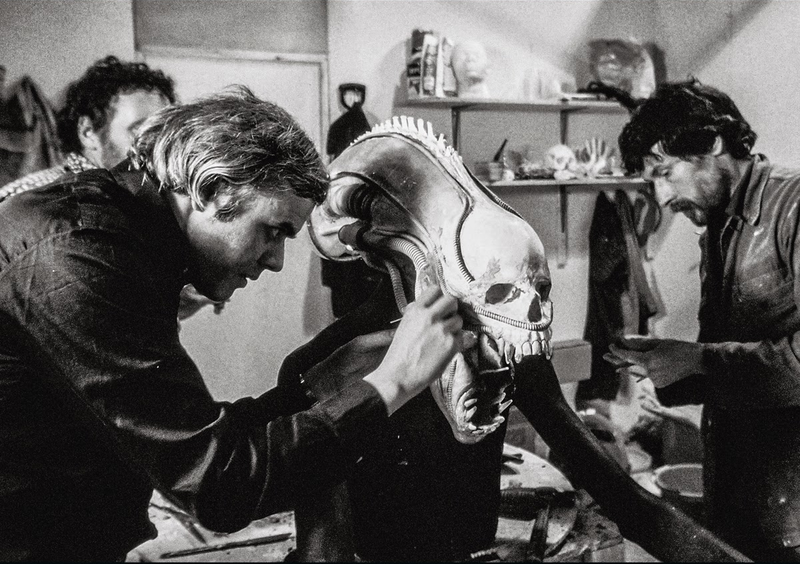 Giger requested actual human skulls so that he could use them to build the Alien creature, instead of using ones made from plastic kits. The production bought him three skulls made available for medical purposes in India, Dan O'Bannon remembered that they had all arrived wrapped in plastic. They were three of the most perfect and beautiful skulls that Dan had ever seen in his life. However he had become slightly suspicious about their origins, since every tooth was intact with not a single filling, and it was as if they were fine young healthy people who had died. It would not be until some years later that his suspicions would lead to a realisation of something else about these skulls. He remembered that they cost something like $700 each because they were so fine. Some years after the production, it would dawn on Dan O'Bannon that the skulls would have to come from young people to be so perfect and assumed that some illegal activity had been going on there to make such things available. It was shortly after the release of Return of the Living Dead in which a character makes a comment about a skeleton farm in India based on a comment that Dan's friend, film director Tobe Hooper, director of Texas Chainsaw Massacre, had made. Tobe stated that India stopped the deportation of all skeletons for medical purposes making it ever since then difficult for medical schools to get them. Giger took one of the human skulls and jammed it into the front of the head area, riveted it into place and then started modifying it. Giger took out a hacksaw, sawed off the jawbone, then extended it by about six inches and creates a distorted jaw bone. He began to attach other fixtures and built an extension to the back of the skull. It was fascinating at the time for Dan that actual human skulls were being used and indeed the presence of a human skull in the construction of the alien would remain a mystery to fans for many years to come. Extending physical anatomy in various ways was something quite prevalent in Giger's artwork as well, so one might easily find extended heads, limbs and fingers and toes in many of his images. 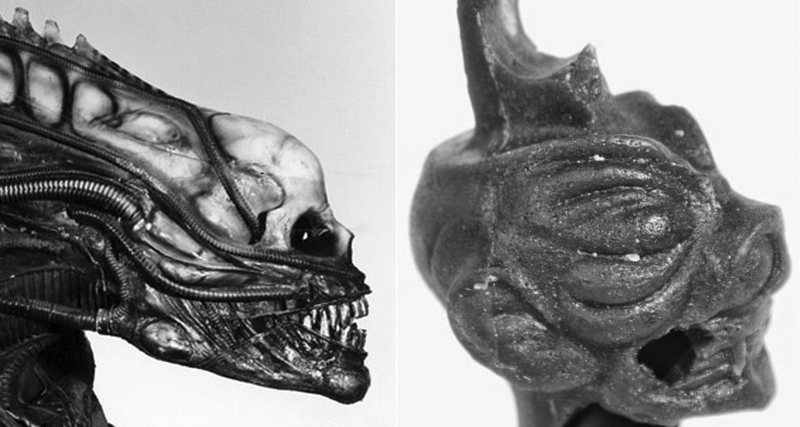 The creature would be given a very long head, and since H R Giger as an industrial designer had the urge to give everything a function, he felt that if it had a long head, then there was space for a long "tongue" and so he gave the tongue teeth since he thought it was a very good filmic device. 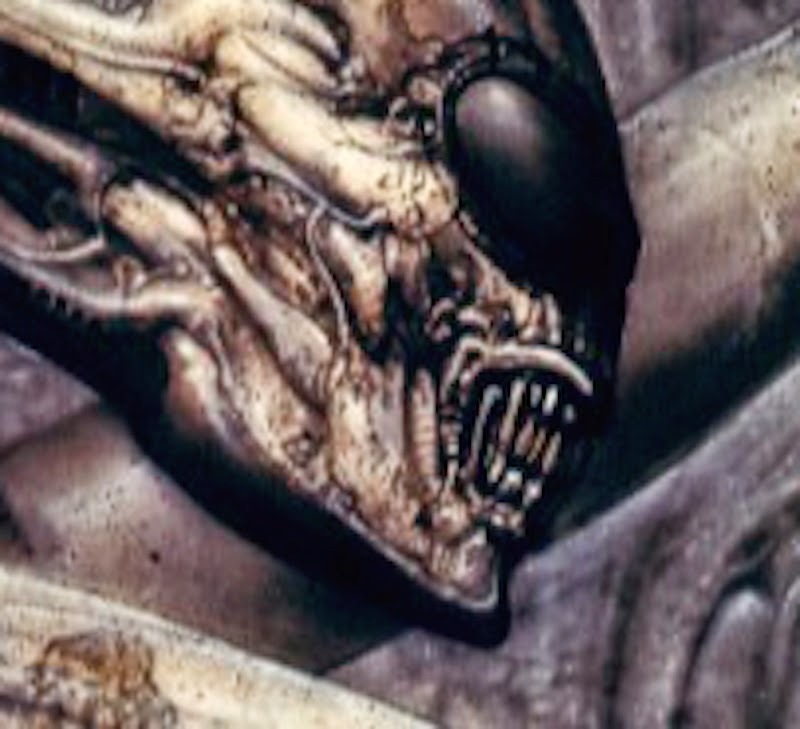 However the idea for this second row of teeth came from Ridley Scott because he hought that Giger's painting Necronom IV had this double row of teeth, and so these would be seen more thoroughly in Giger's first drawings. Ridley told him to make it so that they could move, to make it somehow frightening and horrible, and did his best to do this. Dan O'Bannon:When he finally got all done, they took a cast of it It was a craftsman who actually cast the rubber costume of Giger's sculpture. When they were finished casting in rubber, he used his airbrush and painted the costume the same way he does his paintings. It's so fascinating to see the old methods people used for film back in the day (which wasn't even that long ago, really). The amount of passion and work they put into it on such a technical and creative standpoint, with this abundant and very real respect for it... I honestly love being able to read about this kind of stuff.